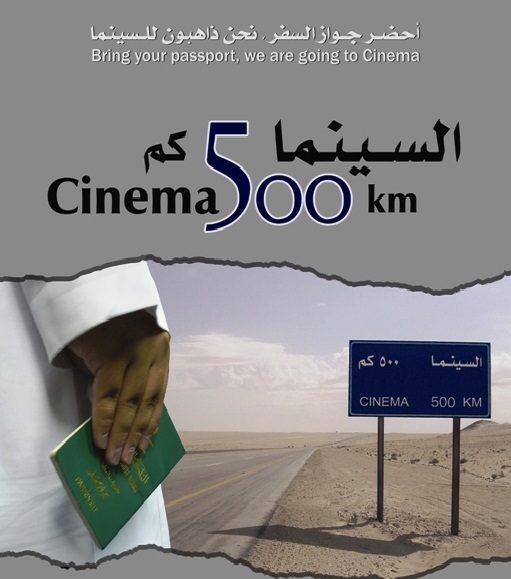 “Bring your passport, we are going to the cinema” was the logline of “Cinema 500 km” (2006), a Saudi documentary film directed by Abdullah Al-Eyaf. To bring your passport go to the cinema seems like an unlike adventure everywhere in the world, that is, everywhere in the world except Saudi Arabia, the theaterless kingdom. Al-Eyaf’s film, shot with permission of the Saudi Ministry of Culture and Information, follows the curious story of 21-years-old Tariq Al-Husaini, a Saudi movie-fan as he embarks on the adventure of watching a film in the cinema for the first time. The movie is a chronic of this journey that begins with Al-Husaini applying to obtain a passport in his home city of Riyadh, then traveling from Riyadh to Khobar, crossing the King Fahd Causeway into Bahrain, until he finally enters the popular Seif Mall in Manama, buys a movie ticket and enters the theater. According to Al-Eyaf: “I wanted to bring out the voices of all those people who have to travel to another country and take a journey of four to six hours just to watch a movie and come back”. The cost and distance of the trip to Bahrain or the United Arab Emirates, only to watch a film in a theater, makes movie tickets for Saudis, the most expensive in the world. Two days ago it was reported that the ultra-conservative Gulf kingdom would be looking at opening cinemas across the country if the government gives the final go ahead, with the cooperation of Ministry of Culture and Information. It was however reiterated that even if films are shown in theaters throughout the country, they would be heavily censored to prevent anything deemed “un-Islamic” from entering the country. Even though films are considered quintessential to the modern experience everywhere in the world, their presence in the Gulf region has been more of an absence. According the Viola Shafik, the scholarly authority on Arab cinema, the Arabian peninsula has been central in shaping the Arab and Islamic identities in regard to language, religion and culture but cinema has remained a margin phenomenon in the Middle East, mostly confined to the once thriving film industry of Egypt and Lebanon that still remains the benchmark of Middle Eastern cinema all over the world. Films made their appearance in the Gulf region only recently, although a film was produced by the former republic of North Yemen and presented to the public in a square in Sana’a in 1962 and then, in 1972, the world was surprised when a Kuwaiti film, “The Cruel Sea”, a tragic love story directed by Khalid al-Siddiq, appeared on the scene and demonstrated great cinematic artistry. The film was featured with a prize at Cathage Film Festival in 1972. The re-birth of film in the Gulf started only recently as prestigious annual film festivals are now held in Abu Dhabi, Dubai and Doha, but local production is still lagging far behind Lebanon and Egypt in quantity and range of topics. The United Arab Emirates have a very limited production and released their first full-length feature film, “The Dream”, in 2005 and since then have produced about 8 films, including Ali F. Mostafa’s “City of Life” (2009) that revolves around Dubai’s multicultural nature; this was the first Emirati film to achieve release in local UAE cinemas. Since 2005, a good number of short films and documentaries made by Emiratis have appeared on the scene and most recently, in 2011, Emirati full-length feature “Sea Shadows”, directed by Nawaf Al Jahani, received critical acclaim following its release in the UAE and will be screened in prestigious festivals in the US this year. The film deals with the traditional themes of culture, religion and tradition – a commonplace in Gulf cinema – but it is considered to be the coming of age of Emirati and regional film. The pioneer in the regional film industry, nonetheless, has been pearl-sized Bahrain, that produced its first full-length feature film in 1990, when Bassam Al-Thawadi’s “The Barrier” was released, followed by a few feature films in the past decade and a good number of short films. Active filmmakers in Bahrain include Hussain Al-Hulaibi, Hussain Al-Riffaei and especially Mohammed BuAli, the most active filmmaker in Bahrain whose last short film was released in 2010. Saudi Arabia, on the other hand, paradoxically enough, has not been entirely absent from the history of Gulf cinema even if the screening of these films is by all means forbidden in the country. Contrary to common opinion films are being made and watched in the theaterless kingdom; over ten full-length features and short films have been produced in the country by local filmmakers and semi-clandestine groups of filmmakers and cine clubs are not unheard of. Besides Al Eyaf’s documentary, in 2006 the first big-budget film, “Keif al-hal?” was directed by Palestinian-Canadian Izidore Musallam and produced by Rotana Group, the largest entertainment company in the Middle East, property of Prince Al-Walid bin Talal. Once again, resorting to the most commonplace topic in regional cinema, the film is a story of a family torn between modernity and tradition. Though the cast of the film is made of mostly Saudi actors, it was shot in the UAE masquerading as Saudi Arabia. There is also a high-profile woman in Saudi cinema, the director Haifa Al-Mansour, who directed, among other films, the popular and controversial documentary “Without without Shadows” (2006) addressing the explosive gender politics of her country. International film festivals in the Gulf and all over the world have taken an interest in Saudi cinema and interesting pieces seem to appear every year, all of them made by indie-like, very low-budget independent filmmakers. In the end of 2010, before the events of Tunisia escalated into the Arab Spring uprisings that also reached Saudi Arabia, the magazine of the European Network of Young Cinema, published an interesting article titled “Springtime for Saudi Cinema?” (by Nadia Muhanna) recalling a meeting with Abdulmuhsin Al-Mutairi, the founder of Talashi, a group of Saudi filmmakers: It is a small independent production company, self-funded and not making any profits at all. According to the article, the group started when the members realized that they couldn’t fund themselves to acquire equipment on their own, so they formed a group that bought equipment utilized by all, in which there are no salaries, fees or profits. Talashi has produced about 12 films to date, and they claim to produce films with under 2000 dollars that are usually paid to the actresses, and as it is expected, there are very few who agree to appear on films. In words of Al-Mutairi: “The important thing about our films is that they reflect reality. Some people criticize us saying that we should paint a good image of Saudi Arabia abroad and I agree with that, but that doesn’t mean not to tell the truth”. As of today Saudi newspapers have film review sections, a Saudi TV station hosted a program on the subject and cartoon movies have been shown in summer festivals. If movies are allowed in Saudi Arabia, it is not going to be the first time: In the 1960’s and until the 1980’s there were movie theaters all over the kingdom, even though the religious police tried to shut them down. In the words of a former projectionist: “We kept young men on bikes stationed near the offices of the religious police, when they saw them coming our way, they would fly on their bikes to alert us… The staff at the theater would quickly turn off the lights in the entrance area, shut the doors and keep quiet to give the impression the cinema was closed”. Though cinemas were closed in the 1980’s, no official policy or law banned public screening of films until 2009, but since then private cine clubs have appeared on the scene, that until now are allowed only for men. The change in official policy might change little in Saudi cinema culture, and films will continue being produced and watched in the country, against the will of the establishment and the conservative clerics. The possibilities offered by the information age bring Saudis and the rest of people in the Middle East, in contact with the latest technologies and entertainment products faster than any government is able to ban them. According to Hungarian philosopher Agnes Heller, “nowadays you can have a server in another country and you cannot censor Internet production if the server is in another country. Some people organize television station on the Internet and asked me to participate. So the technology is above it. In the classical style of the Soviet Union, technology allowed that everything could be supervised. Now not everything can be supervised”. In the meantime, Saudis remain repeating themselves the story of Al-Husaini, traveling for several hours only in order to watch a movie in a theater, living through Al-Eyaf’s movie time and again; what to a Western audience would seem a product of the most vivid imagination. More than anything, the emerging film culture in the Gulf has served as a platform of social realism and criticism for many, raising voices that reach further than books and newspapers and that now reach audiences all over the world, and most likely will continue to do so in the future, with or without public screenings in theaters. While this might be true for the West, cinephilia and the cinephilic desire triggered by non-public cinema is very much alive in Saudi Arabia and elsewhere in the region in spite of the increasing censorship. It might be that the love inspired by cinema in the Gulf, is only beginning now, and it is very far from dead. In that sense, the Arab Spring of Saudi cinema might have begun already, preceding the Arab Spring by at least half a decade.